Ever wanted a life coach or a personal development mentor, but couldn't find the right one or afford the right one? Well, one publication is hitting the market offering the best in life coaching from the world's leading experts. 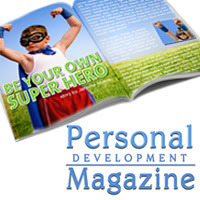 Personal Development Magazine just launched its premier issue and offers success training in areas such as wealth building, finances, goal setting, health and fitness, relationships, travel, spirituality and much more. Each issue curates the knowledge of world experts in the fields of personal development including, motivators, teachers, life coaches, corporate CEO's, spiritual leaders, health and fitness gurus and financial giants amongst others. Promising to deliver a healthy mix of inspiration and practical strategies, the magazine offers an easy and affordable solution to getting powerful tools for expanding ones's life.